We are on the outskirts of the Suffolk town of Bungay, but on the Norfolk side of the river. 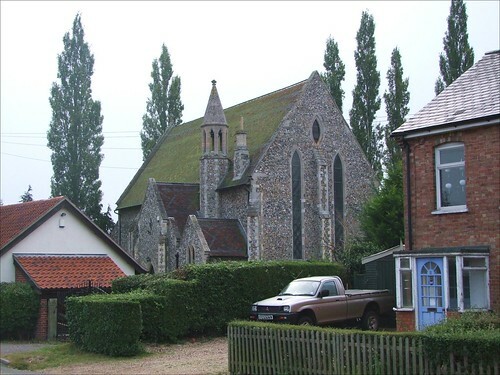 The urban area of Bungay sprawls into two Norfolk parishes, Earsham and Ditchingham, and the hamlet of Pirnhow is in Ditchingham parish. This donative church was built in 1863 at a cost of £1400, about a quarter of a million in today's money. A perky little bell turret rises above the porch, and the west end windows consist of two enormously tall, narrow lancets and an oval medallion, all most unusual. The chapel is now a private house, although it appears to have been empty for a number of years. The literature seems to confuse this with All Hallows church up in the village, which opened in 1865. The All Hallows church, which is still used by the retreat centre, had the status of a chapel of ease, but it was really intended by the Suckling family as a convent chapel. This was a scandalous idea in East Anglia at that early date. Despite the attempt to present it as a chapel of ease, Rev. Suckling was accused of keeping a harem, an outrageously offensive slur in mid-Victorian times.